If you’ve noticed your site running more slowly or seen your storage space creeping closer to 100%, there is another easy remedy. 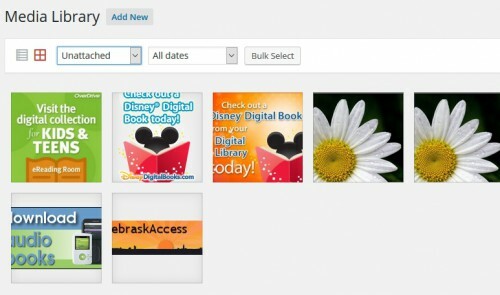 On your dashboard, go to the Media section, then click Library. By default, you should see all the media items (images) that are active on your site. But clicking the drop-down menu and changing “All media items” to “Unattached” will show you only images that aren’t currently being used on your pages or posts. These might be duplicate images that were mistakenly uploaded or items that you’ve used in the past. But even though they’re not visible to your visitors, they’re still taking up space on your site. Deleting these unneeded images is one of the easiest ways to regain storage space and boost your site’s speed. This entry was posted in Blogging and tagged media, storage. Bookmark the permalink.